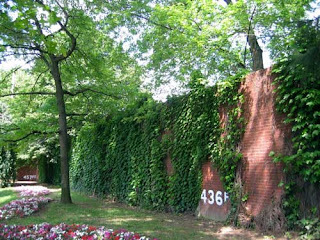 A portion of the outfield wall of the old Forbes Field, home of the Pittsburgh Pirates from 1909-1970, still stand on the Pitt campus. Pretty spacious park. This is right-center field. Center field, which can be seen in the distance on the right was 457 feet. 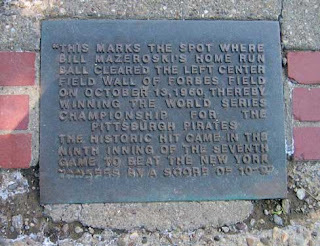 Plaque commemorating Bill Mazeroski's homer, the one that made Mickey Mantle cry. 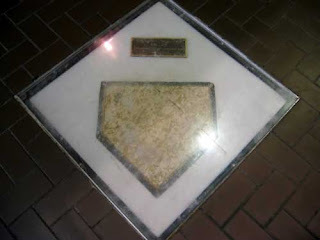 Home plate of Forbes Field is preserved under glass inside Posvar Hall. Didn't see this until I stepped on it. Some of the retired numbers of Pitt football players. Tough to read, but it's 13-Marino; 33-Dorsett; 42-Goldberg (not the wrestler); 65-Schmidt. Never heard of the last two. Pitt alum Tony Siragusa sharing a cheeseburger with the head linesman. UConn warm-up field goal attempts. Got to share a laugh with Dave Wannestedt's moustache, an avid Runway reader. Dave Wannestedt spent most of the pregame taking photos with anyone and everyone. After the outcome, maybe he should have spent a little more time working on the game plan. Heinz Field. Those folks lining the end zone and sidelines were high school recruits and their families. This game probably didn't do a lot to sell them on Pitt's program. More of Heinz Field, a stadium named after a ketchup (or is it catsup?) but colored mustard yellow.